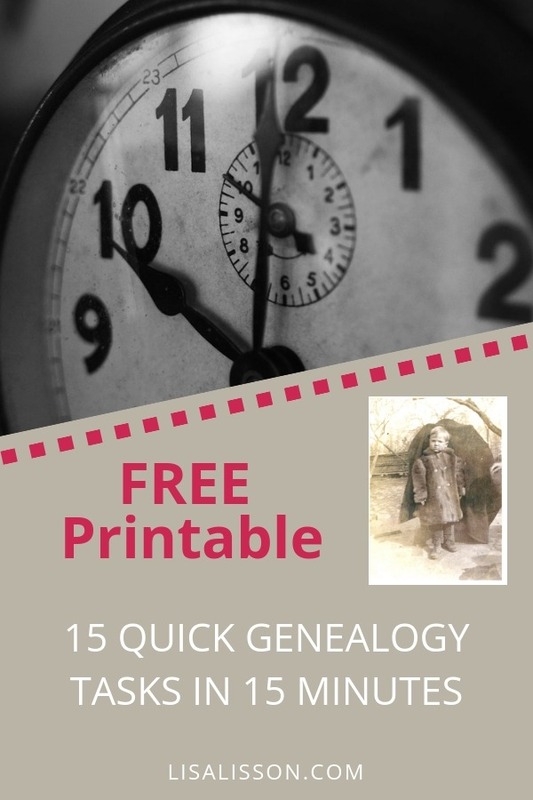 Free Printable - 15 Quick Genealogy Tasks To Do in 15 Minutes | Are You My Cousin? Genealogy can be time consuming. You feel like you just get started researching your ancestor and you are out of time for that day. It happens to me, and I know it happens to you! A lack of time is one of the most common frustrations I hear from readers. You CAN perform quick genealogy tasks in 15 minute time increments! Next time you have 15 minutes free to research, use this list to get you started. I’ve also provided you with a free printable version at the bottom of this post. 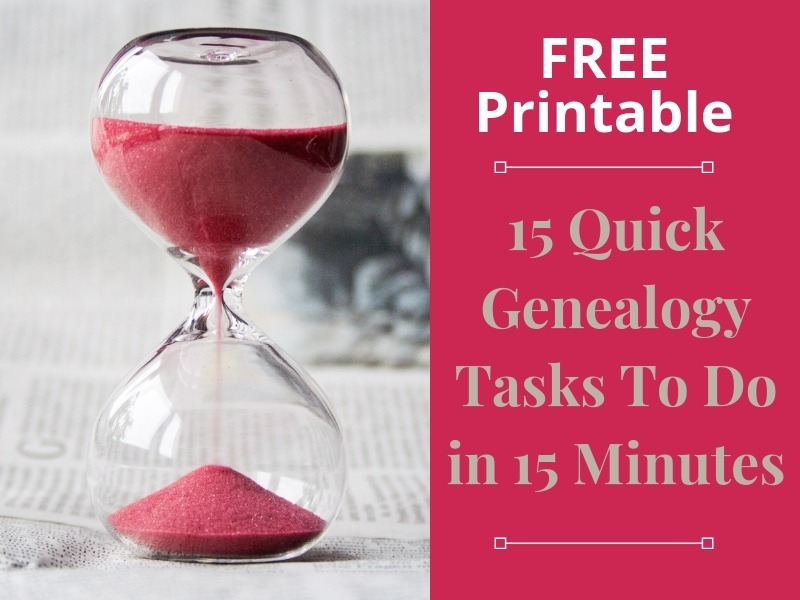 15 Quick Genealogy Tasks You Can Do In 15 Minutes + A Free Printable! Re-check a database for updates. 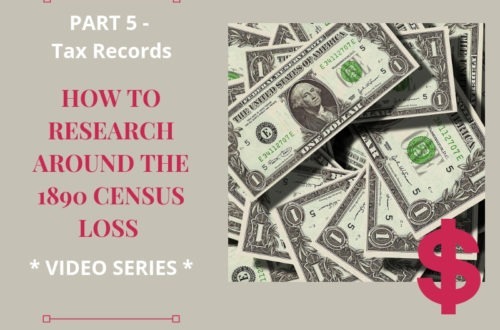 Determine what needed records exist and where to find them. Join a genealogy related Facebook group. Join the Are You My Cousin? Facebook group! Post a query in a Facebook group. Answer a question in a Facebook group. Gather supplies for your next research trip. Create your genealogy education plan. Watch a genealogy video tutorial video. Find great genealogy videos on the Family History Fanatics YouTube channel. Order a DNA test kit. Watch the Genealogy Bargains page for the best deals! Read a genealogy blog post or two. BONUS: Check Google Books for family and county histories pertinent to your research. 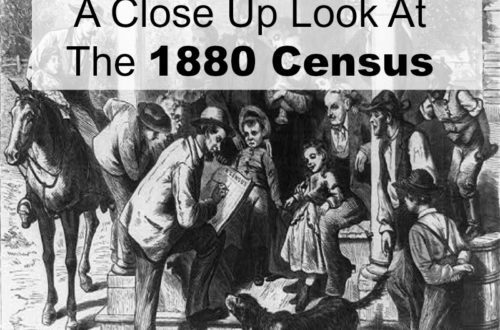 Did you think of a quick genealogy task you can do in under 15 minutes? Add it in the comments below. Download this free printable genealogy tasks list here and keep it close by when you have a few minutes to research. Find 15 MORE quick genealogy tasks in this second post! 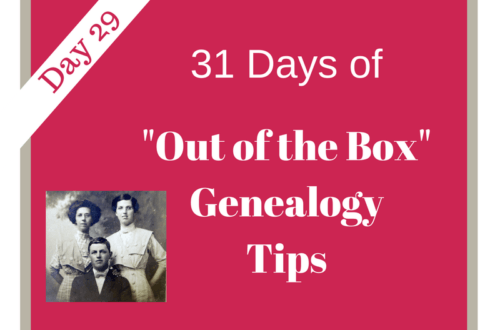 31 Days of “Out of the Box” Genealogy Tips – Cookbooks!